Halloween is almost here and I know my blog is normally about healthy recipes, however it is that time of the year we all deserve a little treat. 🙂 My daughter Laila loves rice crispy treats no matter how old she gets so I wanted to take them up a notch for Halloween. 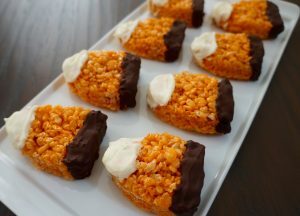 I found these candy corn marshmallows at Target and away we went with this recipe. The interesting thing about these marshmallows is they didn’t seem as “sweet” as normal marshmallows which we loved because these turned out perfect. I did add some melted chocolate which bumped up the sweetness but they were great just plain as well. Melt the butter in a large pot and add the marshmallows and stir until everything is melted. Then turn of the heat and add the rice cereal and mix with a large spoon until everything is coated. Then transfer the mixture to a baking dish and press down evenly and leave it to set about 20-30 minutes. Once they are set use a cookie cutter and create the candy corn shape and transfer to a baking sheet. Next, place the chocolate chips in two separate bowl and place in the microwave for 8 seconds at a time (twice) and stir in between to melt the chips. 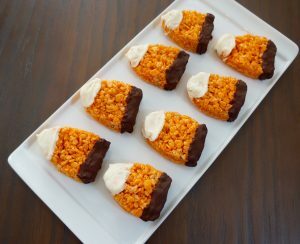 Then with a butter knife simply add chocolate to the top and bottom of the crispy treat and leave to set again, this time in the refrigerator. The treats should only take about 20 minutes to set and then you can store them in an air tight container.